The Syncro System center in Fernelmont (Belgium) launches their latest advertising campaign: the country's flag 'remodeled' in their service center. In terms of creativity, the Belgian Syncro System branch would walk away the clear winner of the company's Palme d'Oro contest. 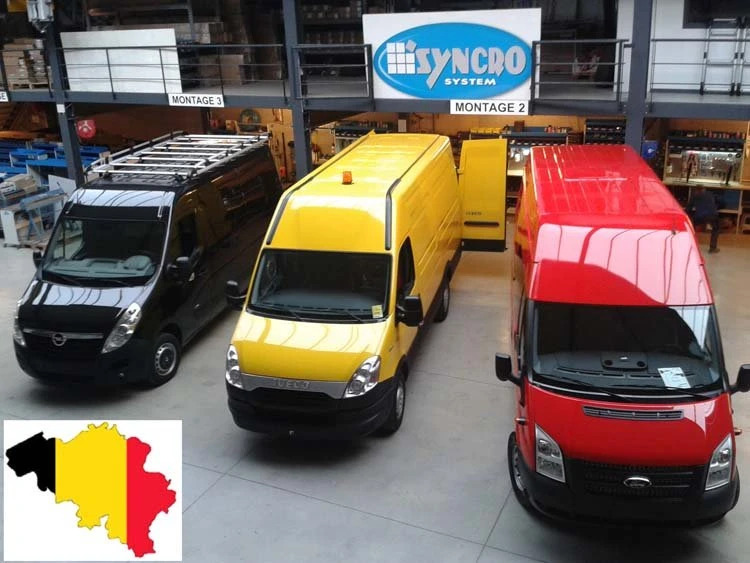 The Belgian retailers with their headquarters in Fernelmont, Syncro System Sprl, assembled a new version of their country's flag using three vans – one black, one yellow and one red – in their service center, modified to carry out Syncro System upfits. Just a few months ago, the same center in Fernelmont (Namur) created the successful ad campaign for the Syncro brand, in which one of its technicians was crowned the “king” of Belgium adorned with red velvet cloak, and perfect reproduction of the royal Belgian crown. The ad came out in the days leading up to the succession of King Philip to the throne. Click for photo! Syncro System has two upfittting branches in Belgium: Fernelmont and Liegi.